The election results are in. To those not familiar with American politics it might seem surprising that Gillett, tool of the Southern Pacific, won rather than the independent. But that's the way it goes hereabouts. Independents, no matter how worthy, rarely succeed as anything more than spoilers. From Teddy Roosevelt to Ross Perot to Ralph Nader, and many in between, they find that no matter how badly qualified or corrupt the Republicans and Democrats, their hold on the election process is certain. The elephant and donkey have convinced the American public that a vote for an independent is a wasted vote. The first cartoon was published on November 7, the second on the 12th. 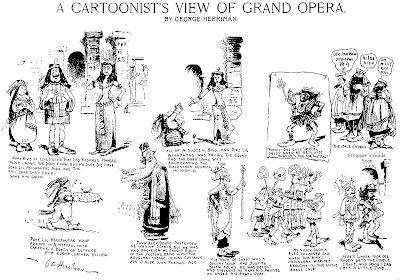 There was one additional Herriman cartoon in the interim but it was in too bad a shape to restore. 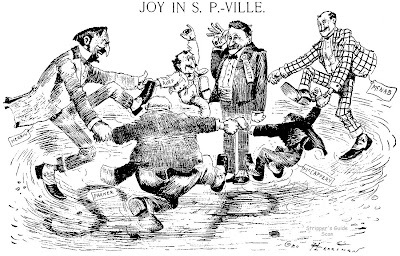 Now that the election is over and Herriman has gotten some well-deserved rest he'll come back with a nice potpourri of editorial, sports and assorted other cartoons in the coming months. Stay tooned! stiil my first port of call every sunday morning. Here's another strip that's been sitting in my mystery pile. This feature did manage to survive long enough to get listed in E&P in 1986, and my one and only example is from October of that year. The creator, Steve Barr, is online and has a website. I sent him an email asking for more information on Snapdragon but unfortunately never received a reply. The Tribune Media strip about a wizard and his magic dragon would probably have a much better reception in the funnies today with Harry Potter mania sweeping the globe. Too bad for Barr that he jumped the gun by a decade or two! If anyone has the start and end dates for the feature I'd love to know about it. Tribune Media must've been in a fairy tale mode in the '80s. Aside from this strip, there was also "Conrad" by Bill Schorr and "Mother Goose and Grimm." Of the three, only "Mother Goose" survived. Were there any other fairy tale strips from Tribune? Steve's my cousin... I don't remember what years the strip ran for, but I'll ask his sister and see if she knows. He's got a series of cartooning books for kids out, in the 1-2-3 Draw set; my daughter just got a couple and is crazy about them. Printed Service, the "ready-print" or "patent insides" used through the years by thousands of weekly newspapers, will be dis­continued by the Western News­paper Union on March 29, mark­ing the end of an era. The preprinted four-page half, backed up with four pages printed locally, has been a fixture in the weekly newspaper field since Civil War days. WNU officials told Editor & Publisher its widely known Printed Service has fallen victim to rising costs of newsprint, pro­duction and distribution, coupled with a declining need for a pre­printed service because of faster, more modern news and feature dissemination methods. The company plans to continue and expand its many other syn­dicated feature services to news­papers. Western Newspaper Union as­sured the 1,412 publishers of weeklies who currently are ready-print users that newsprint equal to the amount included in their Printed Service and feature mate­rial in grooved plate, mat or copy form, will be available. Hardship is not expected to result for most weekly newspapers as nearly all of them now have typecasting machines and casting boxes so they can make plates from mats. "The decision for the suspension was reached because mount­ing costs required a price increase which would have taken the Printed Service out of the cate­gory of a sound, economic value for most weekly papers," ex­plained Farwell W. Perry, WNU president. While hard, economic facts dic­tated the suspension, it was obvi­ous that recognition of newspaper publishing progress in the rural field was involved in the action. With improvements in weekly newspaper machinery, with the de­crease in the number of weeklies and the increase in the number of larger and more prosperous week­lies came a decline in the need for the readyprint service. "We helped them grow and then lost them," observed W. W. Brown, executive vice president of WNU, with a broad smile. "There are no more frontiers." Printed Service has been fur­nishing 1,250,000 copies, produced in 27 plants throughout the U.S., each week for its current 1,412 customers. At one time, it printed four pages each week for ap­proximately 7,000 newspapers. WNU was still supplying Printed Service to 4,500 newspapers in 1923. While Printed Service once rep­resented 100% of the company's income, it was only 5% of last year's sales volume. The total volume, incidentally, increased from $7,000,000 in 1938 to more than $22,000,000 last year. Expansion was accomplished in other feature service sales, mer­chandising of paper, printing ma­chinery and equipment, plastic plates, commercial stereotyping, typography and electrotyping for advertisers and advertising agen­cies. Plans were announced for ex­panding the company's editorial, art, sales and service efforts for further improvements and devel­opment of all types of newspaper features tailored especially for non-metropolitan newspapers. WNU's Budget Service, provid­ing two pages of material in mat form, is available to the papers that have been using readyprint, in addition to other editorial fea­tures. Some small dailies use the Budget Service. Charges made to the papers failed to cover costs of newsprint, features and delivery, according to Mr. Brown. WNU had the privilege of selling national ad­vertising in a certain amount each week and this made up the loss and provided a little profit, which meant that, in effect, part of the advertising receipts went to the weekly publisher by making up the loss in the operation. The company will still offer Christmas, graduation and other special features, including car­toons and comics, in plate form, to be used on patented grooved metal base. "As the buckboard, five-cent cigar and nickel beer have disap­peared from the American scene, so goes Printed Service," observed Mr. Perry. "America has been a richer place for having had all of them but it is not poorer for having outgrown them for indeed they have been outgrown even as many of the elements considered essential today may be outgrown in the future." An anti-trust suit, entered at Jacksonville, Fla., by Attorney-General J. Howard McGrath against WNU and two of its sub­sidiaries (E & P, July 7, 1951, page 15) is still pending. The suit, charging the defendants with attempting to monopolize supplies and services to the rural printing industry of the U. S., grew out of a complaint by a Florida weekly. WNU officials said one reason they have maintained Printed Service as long as they have is because they sell ink, type, print­ing paper, machinery, stitching wire for job plants and other sup­plies to the customers from the company's 17 paper houses, which carry a $3,000,000 paper stock. None of the company's 44 branch offices will be closed. It is expected that only 40 or 50 printers will have their employ­ment affected and it was explained that they easily can obtain other work in their field. Six or seven of the WNU plants will continue to do commercial printing. It was in 1865, when the Civil War was creating a labor short­age, that Ansel N. Kellogg, pub­lisher of the Baraboo (Wis.) Re­public, a weekly, made arrange­ments with the Madison (Wis.) Daily Journal to print half of his paper, filling it with material al­ready used in the Journal. The daily paper branched out and be­gan supplying such service to other weeklies. Mr. Kellogg went to Chicago, formed the Kellogg list and be­gan supplying readyprint to week­lies in competition with the Madi­son daily. Later, the West Vir­ginia list, the New England list and other similar groups were formed for readyprint services. George A. Joslyn supplied a list of weeklies in Iowa. He man­aged to buy other lists, combined them into a Western Union of lists, with headquarters in Omaha, Neb., to serve the recently estab­lished newspapers in the vast trans-Missouri empire. Mr. Joslyn's enterprise grew into the com­pany now known as the Western Newspaper Union and spread its operations over the entire coun­try, gradually adding other serv­ices and supplies. The general office was moved to New York in 1929. John H. Perry, publisher of multiple dailies and weeklies in Florida, became president in 1938 and a year and a half ago he be­came chairman of the board and his son was chosen president. Readyprint pioneered syndica­tion as an economical and prac­tical production aid to early hand­set papers in tiny communities that could not support eight pages a week. "The weekly publisher was able to give his readers a well-bal­anced community newspaper in a way that would have been impos­sible had it been necessary for him to set all the material and print it himself," asserted Mr. Brown. "The history of Printed Service, then, corresponded exact­ly with the growth of weekly newspaper enterprise. Both coin­cided with the wonderful growth of America. "There was a far different pat­tern to newspaper work in those days," he continued. "The itiner­ant printer, with a 'shirt-tail full of type and a G. Washington hand press' was a familiar character. These pioneer publishers formed the van of westward emi­gration. From the 1870s up to about 1910, each new community, when its population reached 200 to 300 and supported a few stores, had its newspaper. "Just how much this Service contributed to the beginnings of American journalism can hardly be estimated," he continued. "This was before rapid distribution of dailies; news magazines were non­existent; radio and television had not been invented. Yet the week­ly newspaper, using readyprint, brought both local and world news to the small towns. "But, even as rural America changed, so did the market for Printed Service," Mr. Brown add­ed. "The quality kept pace and the price remained right but the need declined. Rural roads were improved, villages grew up or were overshadowed by larger towns. The weekly newspaper population of the nation declined. Those weeklies remaining, for the most part, improved their print­ing facilities." During this early period, news of agriculture was needed to im­prove the farms. Printed Service played it up. There was a dearth of good fiction in small towns for 50 years before community libra­ries were established. Printed Service ran hundreds of complete novels in serial form by such writ­ers as Rex Beach, Jack London, Booth Tarkington, Zane Grey and others. Readyprint featured for many years the grassroots cartoons of Magnus Kettner, the "Weekly News Review" by Ed Pickard, sports by Dixie Carroll, illus­trated fashion notes by Julia Bottomley and Nellie Maxwell's "Kit­chen Cabinet." 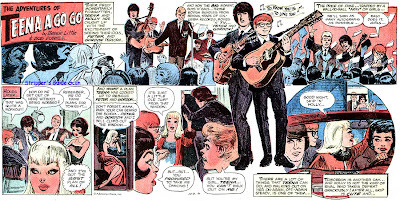 Teena A Go Go was a short-lived strip about a teenage girl, a soap opera-adventure mix with that inimitable 60s mod overtone. The strip was written by Bessie Little who definitely had a feel for the genre (she had been the editor of various teen and movie magazines in the 1950s) but was not cut out for writing a comic strip. As you can see in the examples above, Little went way overboard with captions and balloons, turning what might have been a better strip into a sea of lettering. The cartoonist on the series, Bob Powell, was a well-known comic book artist. Powell became a fan favorite in the 1940s with an art style that was recognizable and a cut above the typical comic book hackwork. However Powell was long past his prime here and the art is muddy and sloppy compared to his best years. Teena A Go Go was syndicated by the Bell-McClure Syndicate, a combination of two old-timer syndicates that merged in 1963. The syndicate was on its last legs and there was probably no sales force left to hawk the new feature. Depending on the how you like the strip, you can ascribe its rarity to that or the quality of the strip itself. The strip also displayed a copyright to something called Publication House, but I have no idea what that is. The strip, which ran Sunday and daily, started on August 14 1966 and apparently ended February 18 1967 (at least that's the latest I can find). The end date is in mid-story, but it may have been cancelled abruptly due to Powell's health -- he would die later that year. One reference cites a start date in June 1966 but I can find no evidence to corroborate that. I researched some of this for Michael Gilbert, who hopes to do a piece on it sometime for alter Ego. I have quite a few of the sundays, but no dailies. If you have a run of the dailies, I'd love to talk about exchanging copies. I finally found that Swinnerton primer you didn't know about and have it ready to scan anyway. 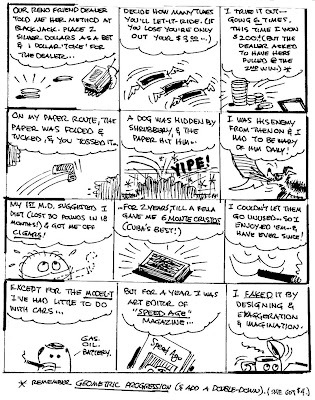 The origin of this strip has to do with the magazine Teen Life, where Betsy Little was an editor. The strip also appeared there in two to four page instalments and was often mesnntioned or even shown on their busy cover. I don't know which version was started first, but the Teen Life one seems to have run longer, which sort of counterdicts the most fashionable idea that the cancellation of the strip had something to do with Powell's illness. Publication House was of course, the publisher of Teen Life. Very good info, Ger, much thanks for the enlightening explanations! Regarding the dailies, I do not have them on hand. A complete run (at least to my above mentioned end date) can be found in the San Antonio Express-News on newspaperarchive.com. In another case of delving the mysteries of obscure comic strips through the good graces of the 'net, here's another that surfaced recently. The artist, Kirk Luehrs, found his name in the mystery strips listing and sent me these samples of his strip Pilgrims. The strip was syndicated from about 1974 to 1976, first through Catholic News Service, then through something called Telefriends Inc. I asked Luehrs additional questions about his strip but sadly never got an answer. So I'll take some guesses. The listing for his strip in E&P also credited Stephen C. Graham. I'm going to guess that he was the writer. Another guess is that the Pilgrims strip actually went by two additional titles -- Jericho Jones and Mister Demgopi -- all three titles were listed in E&P, and Luehrs said in his email that Jericho Jones was the main character in Pilgrims. "Kirk Luehrs has been a northwest artist, writer and illustrator for over 30 years. Known as Bro Kirk, he was a contract illustrator, writer and editorial cartoonist for the Oregon Journal, and the Oregonian newspapers in Portland Oregon. He wrote and illustrated the internationally syndicated cartoon strip, Pilgrims for three years. Kirk wrote and illustrated 18 books for children and young people, 12 on contract for Word Publishing Co. Waco, Texas. He has worked as an artist, art and creative director for northwest advertising agencies, and fortune 500 companies, working in both print and electronic media. He was the owner of Luehrs Advertising for ten years. In his early years his sand and oil paintings were in high demand after his shows in the San Francisco Bay area, not to mention his psychedelic and electronically flocked posters. Kirk’s interests turned to fine line pen and ink drawings for newspaper and magazine publication for a number of years after that. Creative direction took him into the commercial and advertising phase of his career. Now that the remaining chapters in his life are growing fewer he is concentrating his efforts on the subjects that delight and amuse him painting, in acrylic’s on canvas and watercolor papers. A world traveler, he draws his inspirations from the people and events around him, both in the northwest and from his other home in the Philippines. While he will occasionally do work on commission, he prefers just having fun and painting the things that he has always wanted too. " Thanks very much for clearing up those questions! Any chance of getting a few scans of Mr. Demgopi and Jericho Jones strips? "Blondie" has a 75-year and counting history, so you might expect that a book bearing this title would afford us a great retrospective of all those years. Well, think again o gullible one. What we actually have here is almost exclusively a selection of Blondie strips from the 1990s and 2000s. There's nothing wrong with that, I suppose, but it's really not what the book cover or the publisher's description would lead us to expect. What we do get, in addition to a copious mix of recent strips, are a series of short essays describing the personality of each of the strip's characters (written as if we don't know the Bumsteads as well or better than our own family after all these years), and two very short sections of vintage material. The first section, a miscellany of strips and isolated panels from the sequence where Dagwood and Blondie wed, is an almost exact reprinting of the same section in a previous book, Blondie and Dagwood's America, published in 1981. The only differences I could find is in the pithy captions, which have been reworded, and the loss of a few of the examples from the previous book. The second historical section, in which we get a short history of the Young family, talks about Chic Young's earlier strips (The Affairs of Jane, Beautiful Bab and Dumb Dora) and gives us exactly one example of each, all of which, again, are culled from the 1981 book (even duplicating the prior book's horrifically bad reproduction of same). Even most of the photos of the Young family, except the later ones, are also reused. Taking the book for what it is, rather than what it claims to be, it is a perfectly decent reprint volume. The selection of recent strips is good, albeit a bit repetitive, as is the strip itself. Reproduction is generally good, although the strips from the 90s sometimes seem to be scanned from tearsheets rather than proofs (why?!) and are therefore not really crisp. Blondie's catering business, which made news in the early 90s as America's favorite housewife entered the workforce, is well represented. 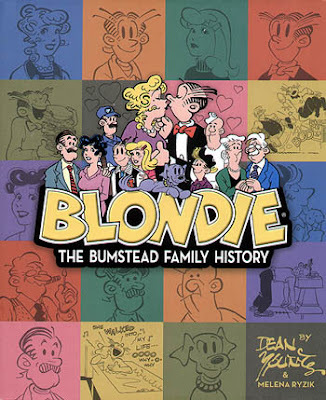 If you are looking for vintage Blondie, give the book a pass and seek out a copy of Blondie and Dagwood's America. If, on the other hand, you want a reprint volume of current strips this is right up your alley. It is often rumoured that Dean young is somehow at odds with his father, even though he's been dead forty-four years. May be that a reluctance to show many Chic Young strips will avoid too many comparisons. I certainly didn't detect any rancor here. My impression is more that the book was intended to be a retrospective of the last decade and then someone got the bright idea that they might sell more copies if they marketed it as if it were a much more ambitious project. Dunno whether the publisher or Dean Young is to blame for the deception. Have you seen the new BC book? Last book Johnny Hart worked on, but sadly not the exstensive experience one might have hoped for. No I haven't. I object to the sort of religious intolerance espoused by Hart in his strip and prefer not to put money in his family's coffers. I recall years ago that there were a whole pack of dogs, not just Daisy. Does anyone know what happened to them, why and when? Those were Daisy's pups. They no longer appear because comic strips are so small today there's no room to draw them all in the current teeny-tiny panels. So sez Young in the book.